The vitreous is a gel-like substance filling most of the eye. The vitreous is the gel-like substance which fills most of the inside of your eye. The vitreous is composed mainly of water and is very similar to a jelly-fish; i.e., a substance which is mainly water, but still has substance. 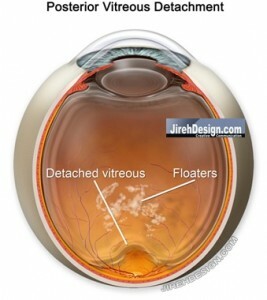 The vitreous fills the posterior chamber of the eye which is the space behind the iris and the lens.